Get it? Get it? Because Owls Say “who”? Clever. 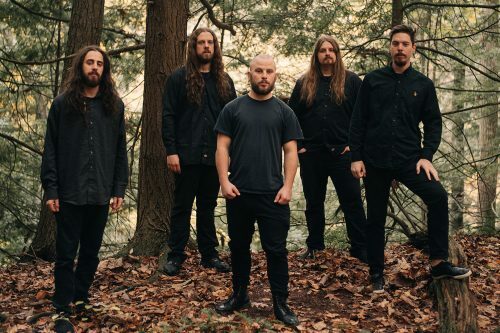 More clever, at least, than Rivers of Nihil‘s previous exercise in eighth-note induced tedium, Monarchy, an album which cemented the band’s tech deathcore/djent style, much to the delight of many fans and critics. Where Owls Know My Name incorporates more disparate influences than ever before, stuffing their metaphorical closet1 with a couple of more vintage t-shirts; King Crimson, for one, and some Pink Floyd reprint that you can’t buy in a department store. A step forward, or another paste-soaked layer of their stiff prog-death collage? 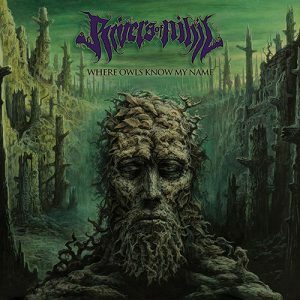 Rivers of Nihil have grown since Monarchy, and Where Owls Know My Name is more mature and nuanced than either of the band’s previous records. Songs like “A Home” hit their emotional marks consistently and feel grounded. Rivers of Nihil have always tried to lend a sense of scope to their music, and here more the ever before they succeed. Yet this still is Rivers of Nihil, and lazy riffing severely impacts several songs. For all of the talk of technical death metal, passages of guitar work more complex than that found on your average atmospheric black metal record can be hard to find on Where Owls Know My Name. In fact, if the guitarists picked up their wrists a little this would sell pretty well under such a label. There’s no need for a band to play anything fancy to make a worthwhile piece of music of course, but endless strings of quarter-note chugs and trem-picked chords that change on bar lines make for a bland album. It’s a good thing, then, that Rivers of Nihil went full prog and enlisted a few wind players to spice up their tepid compositions. The counterpoint between dry chugging and lush, atmospheric passages of saxophone rambling, harmon-muteed trumpet, and pensive clean guitar proves to be the album’s greatest compositional move. Indeed it is the best provisioner of momentum the album has – take “Terrestria III: Wither,” an instrumental that foregoes the band’s usual focus for an atmospheric trio of saxophone, trumpet and viola. It would be quite beautiful were it not covered in an industrial drumbeat and, of course, extremely loud. Other prog contributions – the saxophone in the title track, for instance, and almost the entirety of “Subtle Change Including the Forest of Transition and Dissatisfaction Dance” – feel somewhat incompletely integrated into their songs. It’s great to bring in guests to solo on your album, but one has to ask themselves what role the saxophone plays on this album. I’m still confused by it. There’s a bit of overcompensation happening here as well. New drummer Jared Klein gets a bit too busy at times to make up for the rhythmic stoicism of his colleagues – “A Home” sees him flailing impressively in every gap, and vocalist/bassist Adam Biggs does an impressive job when he focuses on his second role, as in the tapped lead in “Death is Real”. Opener “Cancer – Moonspeak” goes for the quiet, subtle introduction so common in death metal albums which spend the next fifty minutes crushed to DR6 and is reprised at the beginning of “Capricorn – Agoratopia,” but these moments are all but drowned out by the rest of the album. Where Owls Know My Name is a big step forward for Rivers of Nihil, a band which after nearly a decade has finally found a way to not sound like a mixtape. I like this album – I might not like most of the riffing, I might think the execution of the band’s prog ambitions to be uneven, but there are few songs here that I can’t find something to enjoy in – a complete reversal from the band’s previous work. With enough atypical interruptions to distract from the all-too-often lifeless riffing, Where Owls Know My Name enjoys limited prog-death success.